the missing first names are: Peter Gathercole, Patrick Craft, George Pitt and (I think) Tony Church. Many of us remained through to the Sixth and I recall playing Rugby with several of them in the Second XV. The letter from Alfred Morris also has a family connection as it is my brother, Michael Warden, in the back row of the photo (see right) on p.256. Is there any possibility that you could send me copies of those two photographs, in digital form? worked. I was at Reckitt & Colman (now Reckitt Benckiser) from 1978 to 1983 near the start of my career, and at Hull York Medical School from 2010 to 2015 towards the end. In between I have spent time in South Africa working on the gold mines and in the USA working for IBM. 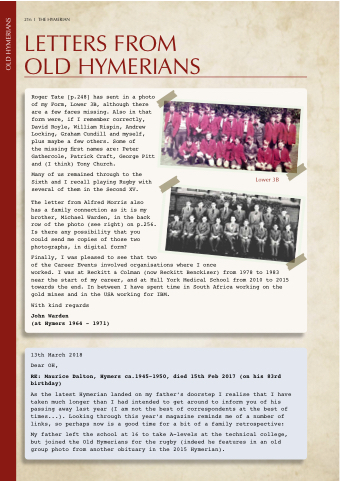 My father left the school at 16 to take A-levels at the technical college, but joined the Old Hymerians for the rugby (indeed he features in an old group photo from another obituary in the 2015 Hymerian).